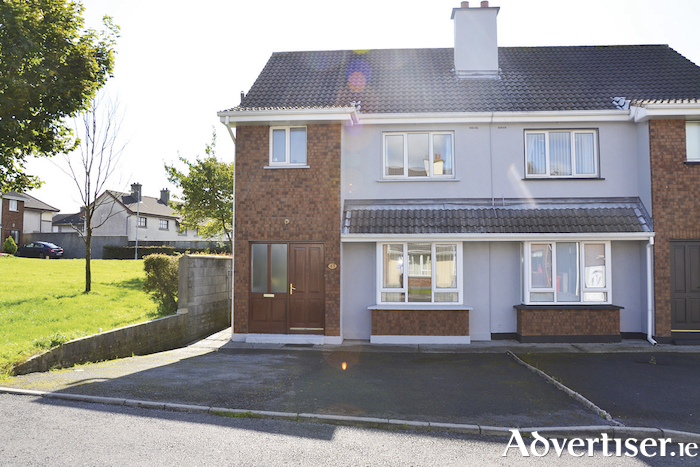 RE/MAX presents to market an exceptional three bedroom semidetached property located in Ballybrit Court, Ballybrit, Galway. Sitting on a corner site, No 45 is in excellent condition, having been maintained and modernised to a high standard by the current owners. Extending to 118.3sq m, living accommodation comprises an entrance hall, living room, kitchen/dining area, utility, three large bedrooms, and three bathrooms. The attic has been conveniently converted complete with separate landing and en suite. The property holds a D2 BER cert on BER cert no 109672410, with oil fired central heating, feature solid fuel fireplace in the living room, and double glazed windows. To the rear is a landscaped garden with flower bed, paved area, and gated side access. To the front is ample private parking and additional off street parking is also available. Ballybrit Court is a quiet, family friendly, estate with a large green area to the side of the property. An array of amenities is in close proximity, including shops, pubs, restaurants, schools, creches, GMIT, Galway Clinic, Clayton Hotel, Ballybrit Business Park, Briarhill Shopping Centre, Iceland, and numerous other industrial estates. No 45 Ballybrit Court is open for viewing on Saturday November 18 from 11am to 11.30am. Contact Martin Healy of RE/MAX on 091 330 300 or view online at www.remaxgalway.ie Asking price is €245,000.